Wetsuit vest is a version of wetsuit top. It is made out of neoprene usually 1 millimeter or 1.5 millimeters thick and it will keep you warm in the summer winds, clouds or bad weather. The only difference is that wetsuit vest does not have any sleeves. Why is that good? For paddling! 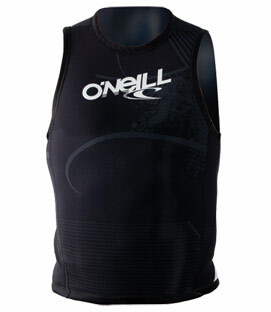 Your arms will feel like you are just in your boardshorts but your body will stay warmer thanks to wetsuit vest. The normal temperature range for a wetsuit vest is the same as for wetsuit top – somewhere between 72F–77F (22C-25C). I need a 4XL or 5XL vest. I have a 65″ girth and wear a 58″ suit jacket. Got any ideas of where I can find one? I live in Oxnard California. Does this mean that it’s suitable for when the water temperature is 22 – 25 C or it should keep the water locked in the suit at that temperature. If my child is swimming in a pool at 23 degreesC will this keep his surface body temp more at 37C or only at 22-25C ?? Also what is better for a child to swim in (not necessarily body/surf boarding) , a vest or a wetsuit top? @Graeme, 22-25C means water temperature, not water inside the wetsuit. Vest is better for swimming because it leaves your arms completely free. But I think this only matters if you are going to swim hard, like training or competition. For just swimming recreationally it doesn’t really matter..